One person was killed and seven people were injured in Fairdale, Ill., as tornadoes and severe storms ripped through the small farming community. CHICAGO -- One person was killed and seven people were injured in Fairdale, Ill., as tornadoes and severe thunderstorms ripped through the far northwest suburbs of Chicago, according to the Illinois Office of Emergency Management. The Rockford Fire Dept. 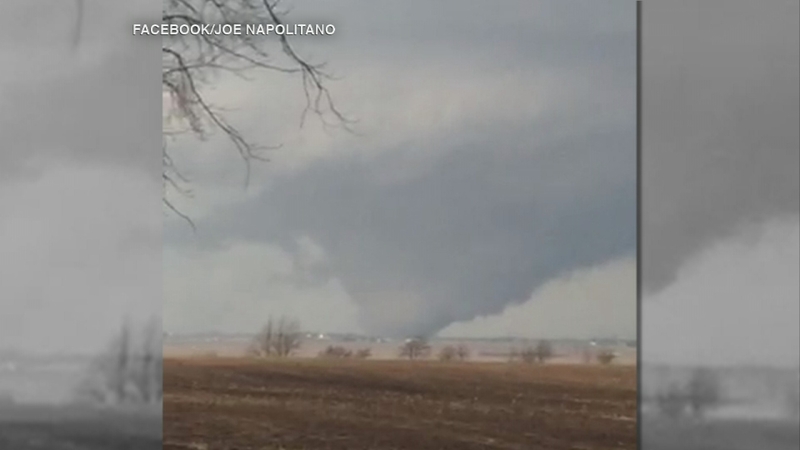 reported widespread damage in the small farming community located roughly 20 miles southeast of Rockford. Rescue crews went house-to-house with heavy equipment and searchlights looking for anyone who may be injured. Officials have not yet identified the person who was killed. Hail and heavy rain fell in the city and Chicago suburbs as lines of storms moved across the Midwest. Tornado damage has been reported by police in Rochelle, Ill., and state emergency officials say a team has been sent to look at the area. A Rochelle restaurant named Grubsteakers was severely damaged by the storm. Raymond Kramer, 81, said he pulled over at Grubsteakers at his wife's insistence, just minutes before the storm struck. "I stood at the door taking pictures of the tornado coming at me, and finally the owner of the restaurant said, 'Everybody in the basement right now! '," Kramer said. "And no sooner did we get down there when it hit the building and laid a whole metal wall on top of the doors where we went into the storm cellar." Kramer was trapped along with 11 others - including the restaurant owners and staff - in the storm cellar for about 90 minutes. "When the tornado hit, we all got a dust bath. Everyone in there got shattered with dust and debris falling out of the rafters," Kramer said. Emergency crews had to remove debris to free them from the cellar. No one was injured, Kramer said. A Rochelle restaurant was destroyed by a tornado. Twelve people were rescued from its storm cellar. Eric Widick, of Rochelle, lives near Grubsteakers. He headed over to the restaurant as soon as the storm passed. "Just saw the restaurant was flattened and there was a semi. There was a garage that set behind the restaurant and there was a semi on its side where the garage used to be," Whiting said. "Your heart goes out to them but as you said we're a community and if one person's in need, we're all going to be there." The State of Illinois Emergency Management Agency said it has activated its state incident response team in various areas that have reported damage, including Rochelle. Funnel clouds were also spotted by viewers in Ashton, Kirkland, and Kingston. 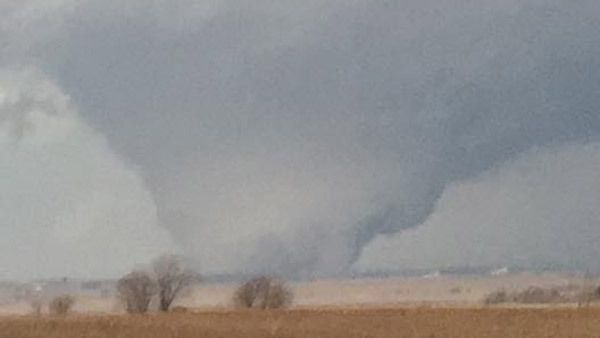 VIDEO: Tornado touchdown in Rochelle, Ill.
ABC7 Facebook fan Joe Napolitano shared this video of a tornado touchdown near Rochelle, Ill. on April 9, 2015. A flood warning has also been issued for Cook County until Saturday night, and flood advisories have been issued for Cook, Lake and Will counties until Saturday afternoon. In the northwest suburbs, at least two homes were struck by lightning during severe storms overnight Wednesday. Clean up crews have their hands full in the Jacksons' Algonquin home after a lightning bolt hit their house early Thursday morning. Brion Jackson and his wife were inside the home when the strike happened. "I kept hearing a crackling sound in the walls and thought maybe it's just one of those squirrels or raccoons, but it turned out the crackling was actually the fire started by the lightning up in the ceiling above where I was sleeping," Jackson said. Smoke filled the top level of the home. 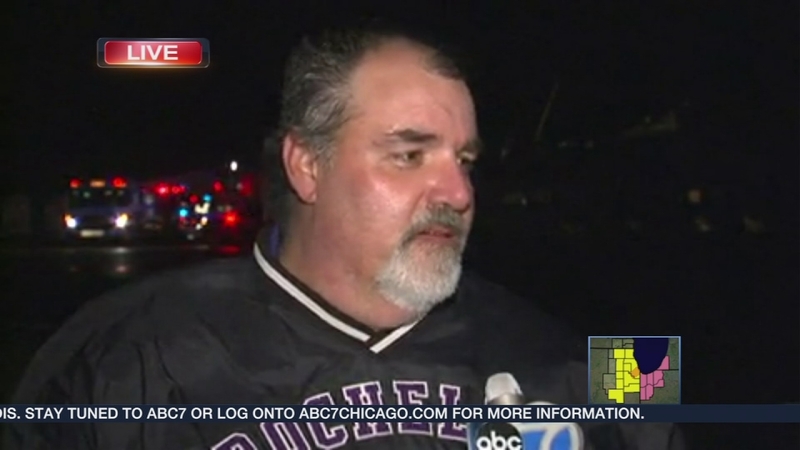 "My wife called out, 'Brion the house is on fire!'" Jackson said. "Well, that will wake you up real quick, I run out, look out the window and, oh my goodness, it was smoke all around." The Jacksons said they rushed to get out. Their family and their three cats are OK, but the damage to their home will take time to clean up. In Mount Prospect, another homeowner rushed outside to safety after lightning struck their townhome. Smoke was coming from the second floor of the unit, located in a complex on Lincoln Street. The homeowner suffered minor smoke inhalation and will be OK.
"They heard a loud boom, a loud clap of thunder and lightning in the area, and after that is when they thought they smelled something burning," said Chief John Malcolm, Mount Prospect Fire Department. In the midst of all of this rain and severe weather, the Metropolitan Water Reclamation District is reminding residents to limit water usage to prevent any flooding issues. "If people aren't using water, five million people, that can leave a lot of room for storm water in that same pipe system," said David St. Pierre, executive director at the Metropolitan Water Reclamation District.